↑ Terry 2013, p. 233. ↑ Ralph H. Didlake, KK5PM; Oleg P. Odinets, RA3DNC (28 September 2007). "Sputnik and Amateur Radio". American Radio Relay League. Archived from the original on 11 October 2007. สืบค้นเมื่อ 26 March 2008. ↑ Walter A. McDougall[ลิงก์เสีย] "Shooting the Moon," American Heritage, Winter 2010. ↑ Swenson, et al, p. 71. ↑ Jorden, William J. (5 October 1957). "Soviet Fires Earth Satellite Into Space". The New York Times. New York: The New York Times Co. สืบค้นเมื่อ 28 December 2015. ↑ "Sputnik". vibrationdata.com. สืบค้นเมื่อ 8 March 2008. 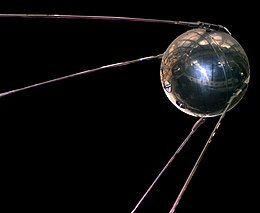 ↑ "Sputnik 1 – NSSDC ID: 1957-001B". NSSDC Master Catalog. NASA. หน้านี้แก้ไขล่าสุดเมื่อวันที่ 25 กุมภาพันธ์ 2562 เวลา 16:43 น.